I wanted to be a super mom. But something was getting in the way. Every year, sometime during the winter season one of us gets sick. And then the rest of us brace ourselves. Seriously, it's like a firing range and we're all sitting ducks just waiting to go down. This started going on in my household in January. We were all, fairly, good the first half of the school year. Then 2014 happened. So I break out the Vitamin C, the garlic, soups, yogurts, juices and slushies to combat the "disease" at hand. We get over the cold and then, in this case, the very next week - it starts all over again. Staying healthy can be hard. 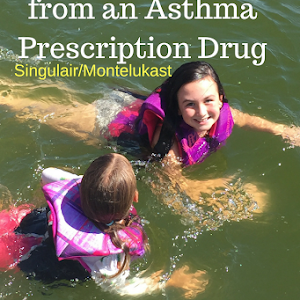 What is a mom to do… quarantine? That's not realistic. Wash your hands a lot, check. Eat well, check. Take vitamins everyday, check. Get sick anyways… check. So why is it that we get sick? 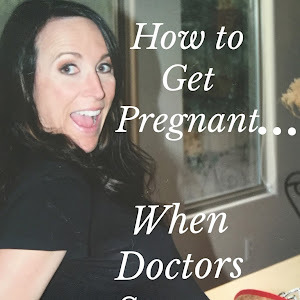 I, Dr. Nicole, as BP (my husband) likes to call me… believe kids get sick, inevitably and perhaps obviously because their immune system is developing. Adults get sick, however, I believe, for one overwhelming reason. Our bodies are telling us to slow down and take care of ourselves. When I was working full time in news, especially during my last few years, I was getting sick ALL OF THE TIME. I started using all my sick days every year and I very clearly remember that panicked feeling when I was coming down with something. I was supposed to call in as early as possible so they could get someone to replace me. Remember, I went to work at Oh-dark-thirty for the morning show. In other words, like 2am! SO I had to decide if I was sick sometime during the 6pm newscast… that's a hard thing to do especially since you usually WAKE UP either healthy or sicker! But it was during that time I started to realize my health, overall, was in a downward spiral. This is a long story which I will get into another time but I believe my health (or there lack of) was the reason I was A) getting sick all the time and B) not getting pregnant. Once I figured this out I decided to change it. I started taking naps, eating better (eating more), going to acupuncture, I generally took care of myself for the first time in a long time. Before this change I literally remember thinking my life was awesome since I only slept about 5 hours a night - I got 19 hours of productivity out of me everyday. I was a super working mom! Now… 5 hours of sleep, I realize is normal for some very highly intelligent, genius type people, of which, I am not one of… so 5 hours of sleep ultimately was not for me. Not to mention, I was no longer in my early 20's when, if I got sick, I just went to work anyways. I was older and needed to take care of myself. This realization started me back on my road to health. Long story short, eventually, after about 10 months of serious self pampering, I got healthier. I felt different. Oh, I also got pregnant. I was still sleepy but I was better, I was happier and I was a super mom. One who was a lot less cranky. Fast forward through the pregnancy, which was awesome and super healing. I had 3 months off of work to care for my newborn. It was exhausting, like it always is when you have a new baby. The time had come to go back to work. But something had happened during my time off. I was a new type of super mom. No longer super SICK mom, I was still so tired but it was different. I couldn't do it anymore. Not only could I physically, not leave my baby because he was, literally, so attached to me… but I knew the health of myself and my family mattered more. I had to choose them and, for that matter, me. When I made the decision not to go back everyone breathed a sigh of relief. I was leaving what I had trained for all of my life. It's true… my parents say when I came out of the womb I started speaking (now that I've had my son - I believe them). I have always loved learning about people and businesses, passions and places. It's just in me. It was a lot to give up but this was more. Now when I get sick... (i.e. : today) the 6 o'clock news comes on and I do not panic, in fact, I chuckle. It reminds me of a life once lived. Now, I really do get sick a lot less. My kids come down with something, even BP gets it and I seem to scoot by it all unharmed. Now, I am more of a super mom than I ever was before. But getting sick, like this week, is a huge reminder of what once was… all the feelings boil back up. I start to, once again, appreciate my new life. I now know what it was like to be a working mom and a stay at home mom. There are good and bad points to both. For me, in the end, it wasn't a choice. I was sick of being sick. My body (and my son) chose for me. I'm glad they did because it made the decision easier. Not to mention, all of that... brought me here. To this blog. I love it. I am blessed by it. It doesn't make me any money. There's about 10 people reading it. But that's okay. I'm no longer a super SICK mom. Sometimes my 7 year old daughter asks me when I'm going back to work and I simply say - I am working. Working on being your super mom. Salads work for dinner or sides. They're filling, (mostly) healthy, bundles of goodness! BP (my husband) has been eating healthier in 2014. It's a marathon, not a sprint. 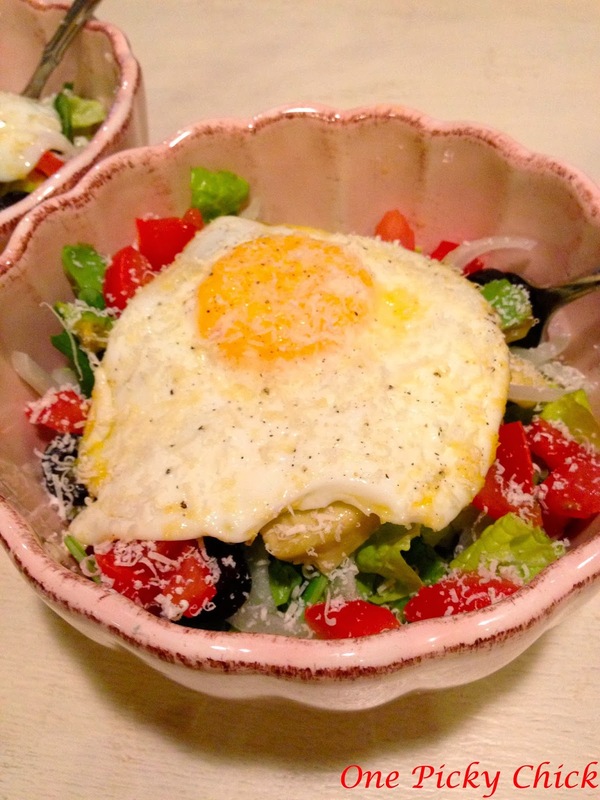 Because of that and just because I love them… salads are kind of my go-to meal many nights. Last night, we had a yummy kale salad that I'd heard about for years. It's made at True Foods, a local Arizona restaurant, and they actually put the recipe on line. Super great! If you want to check it out click here… it comes out just like the picture you'll see. Even BP was impressed! Anyhow, I think you can be super creative with salads. You can put things, perhaps a little unexpected, in them and it almost always turns out fine. 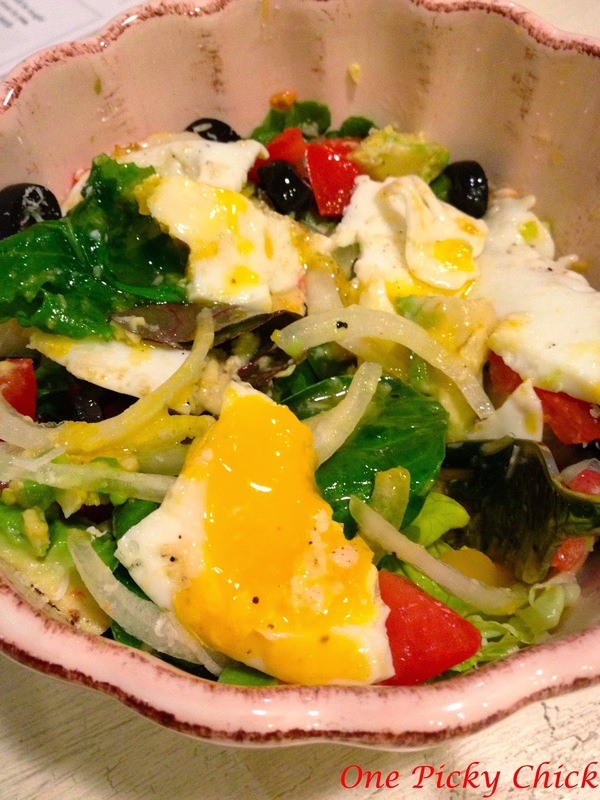 One is a creamy, dinner salad with egg, olives and avocado (plus bacon if you want) … the other is more of a side salad that would go with anything from steak to soup and sandwiches! Both are excellent, just different. 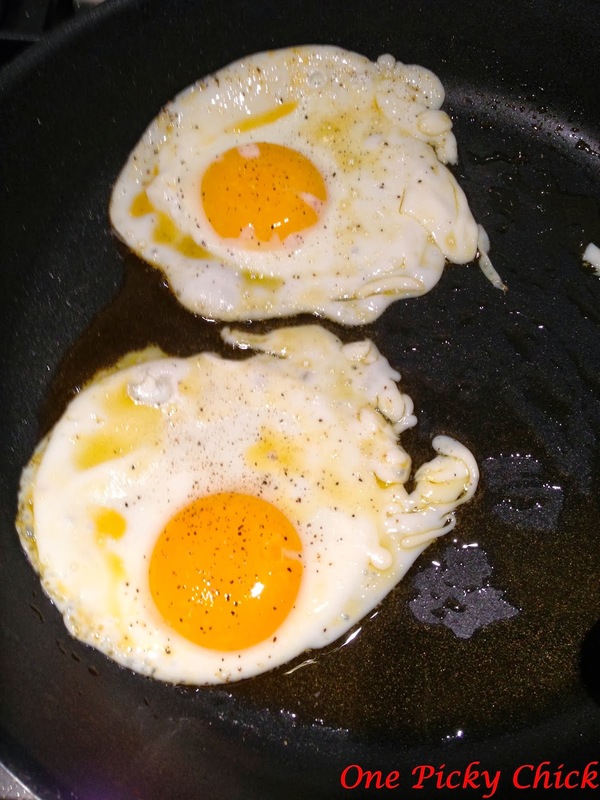 and then fried the egg. I think it may actually be the first time I fried an egg, I much prefer scrambled! As expected, it was easy. 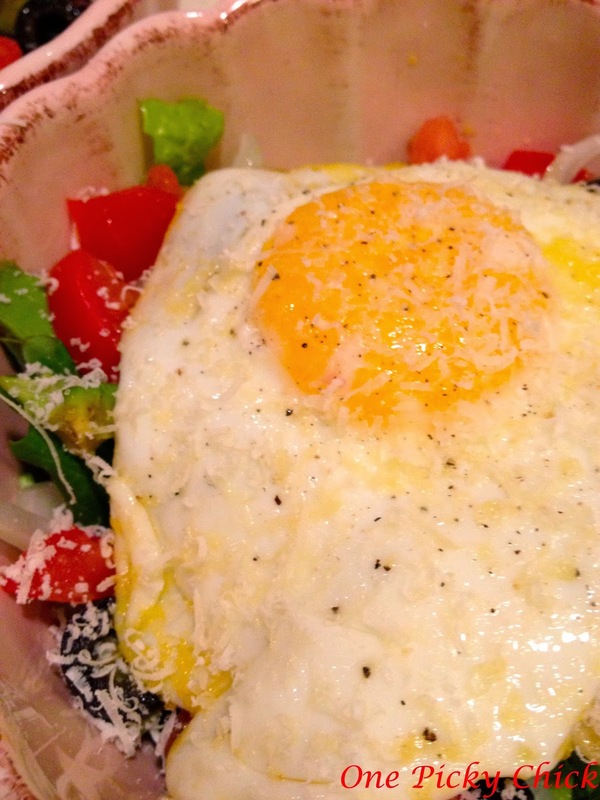 Once I fried the egg, I grated the parm on top and added some Italian dressing. It was delicious, all the flavors unified really well. But as we ate it I told BP bacon on top would really make the dish! Seriously, a little crumbled bacon would have been glorious on it. Not bacon bits. I curse bacon bits. So horrible. Just fry a couple pieces of the real stuff, crumble it and you're in business! Then when you eat it, rip into that egg yolk and your dining adventure has begun!! It was major yummy! Now, the next salad is used as a side for supper. 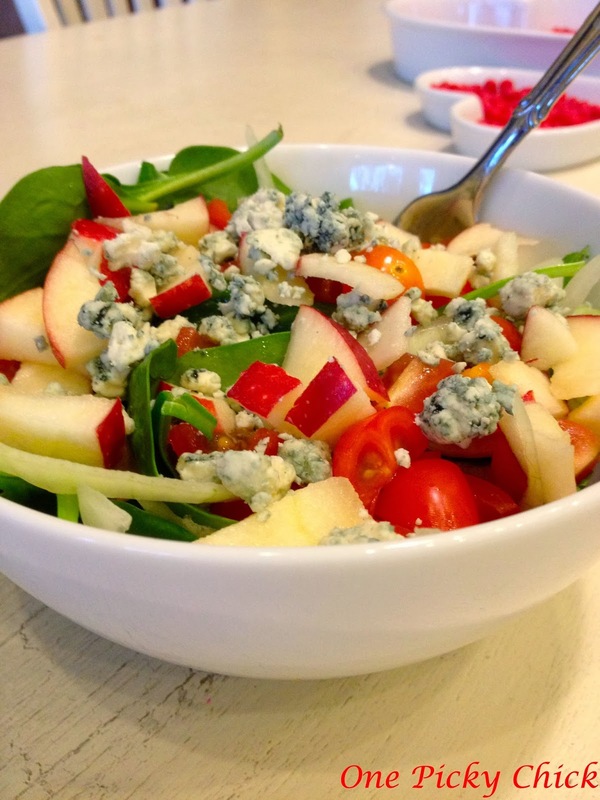 It begins with spinach, chopped apple, onions, blue cheese, tomatoes and if you'd like to add some sunflower seeds - go for it! 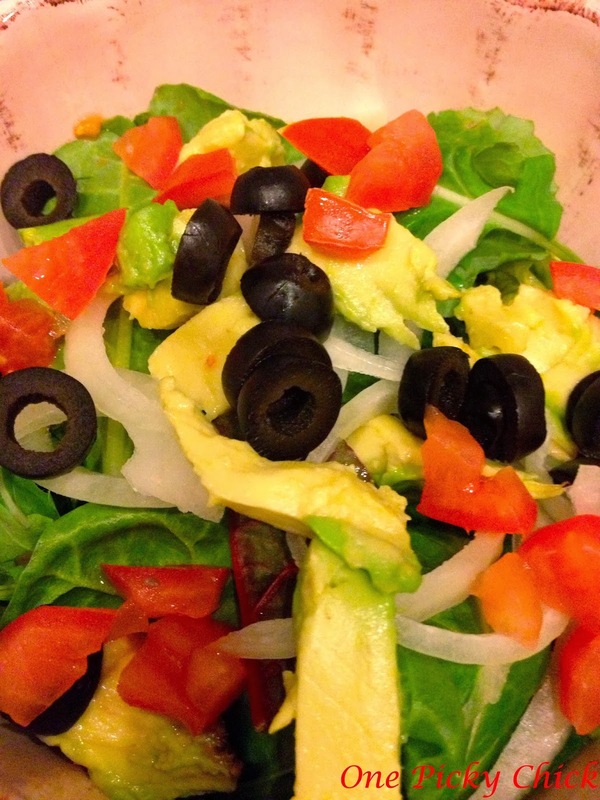 Everyone seems to love this salad as a side. If you despise blue cheese (unbelievably you're out there!) you can substitute with almost anything else, just not cheddar. 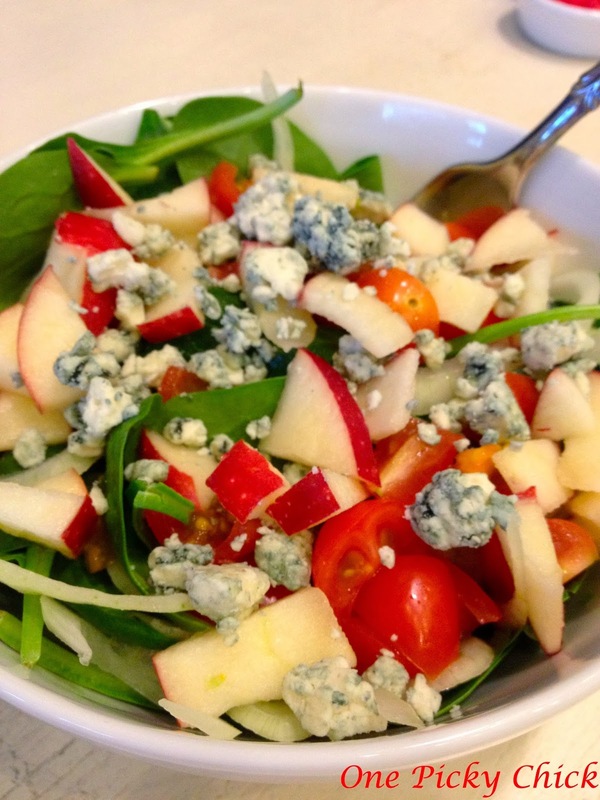 A hunk of warm brie could be really cool on this… but I just happen to love blue cheese! Then I top it with my fabulous Italian/ranch dressing and we're in business! 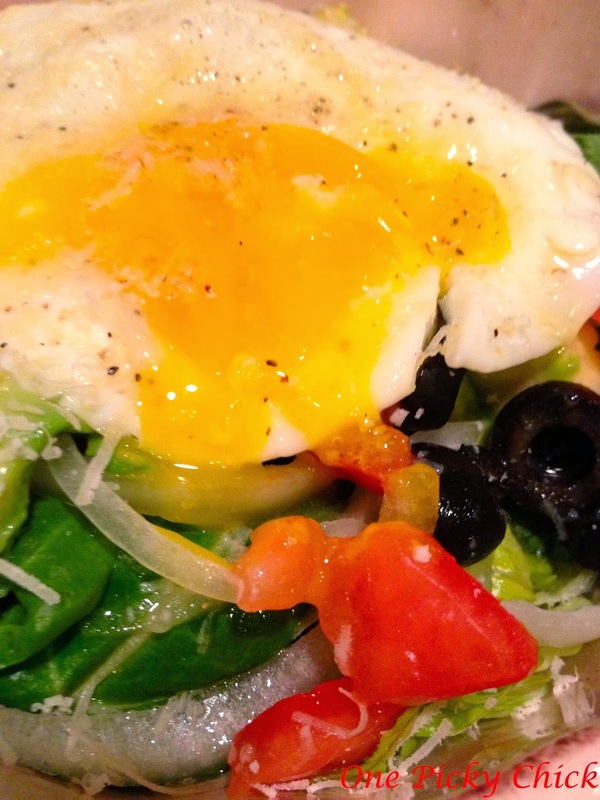 If you're unclear on what that is… search "fake make your salad dressing" on this blog! 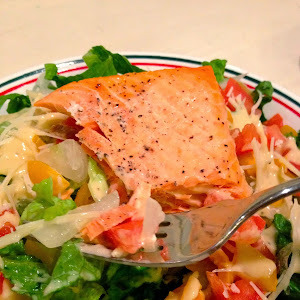 Have a super supper salad! Can I just say that I love giving gifts. At the same token, I forget everyone's birthday. All the time. It's a huge problem. It has happened, on more than one occasion, that I have actually been talking, on the phone, to a birthday person but have not wished them a Happy Birthday. I find out later and feel like a tool. So lame. Now that these I Phones are out, I think, with their calendar, I will be better. At least one can hope. However, with all of that said… I do really like giving gifts. But not necessarily expensive, high maintenance ones (though sometimes those are warranted too don't get me wrong)… instead, gifts (I often refer to as prizes) that come from the heart. Something that person wouldn't necessarily think to get themselves. The only problem is… sometimes those are hard to come up with… actually, they always are! It takes some thoughtful peace and quiet. As moms, that's hard to come by… I usually get it during my walks (part of my exercise "regime" - if you could call it that). Anyways, enough chatter… this is my latest idea. remember the night: the wine, the company, the conversation. I loved it! Great idea. I just never did it. Does that ever happen to you? Please say yes, I need some validation here. and then he used the one legit purchase (key rings) that I bought from Michael's. He attached the rings to the doo-dads and screwed/twisted that into the cork. Done. We made a bunch! 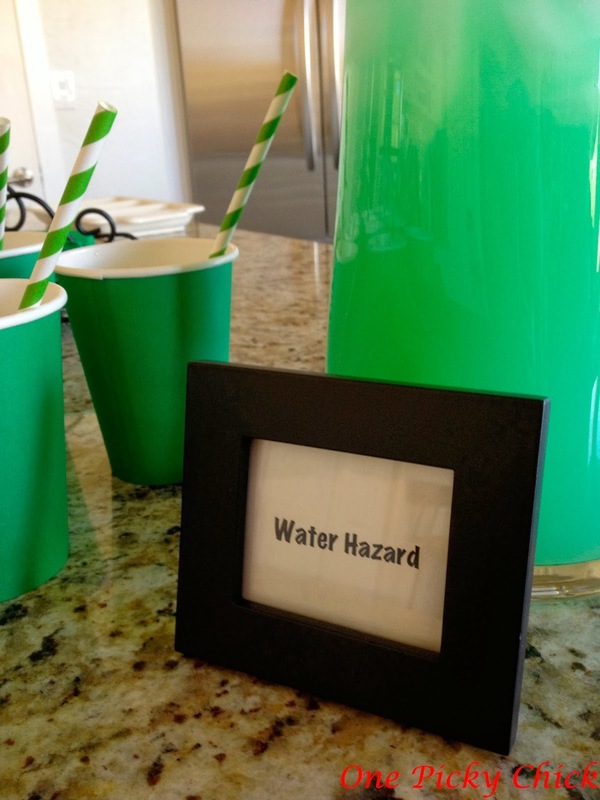 For my purposes, on this next occasion, they'll be used as take-away prizes after the party. But I much prefer the idea to go beyond that - for it to mean more. 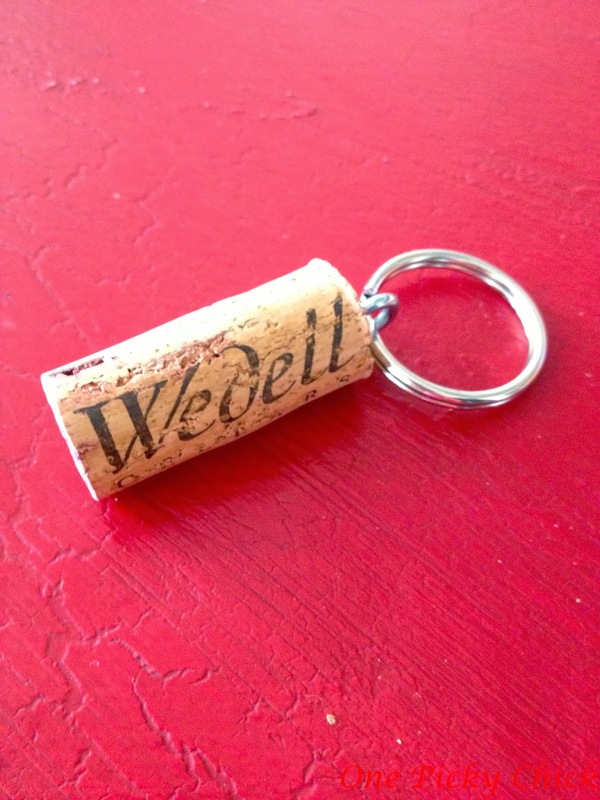 For instance: you and a friend have a great bottle of wine while watching your favorite chick flick which brings you to tears and a great conversation - key chain it! The man of your dreams brings you chinese food, roses and a beautiful bottle of Zinfandel - key chain it! Your mom and dad take you to dinner for your 21st birthday and you taste your first Rose - key chain it! 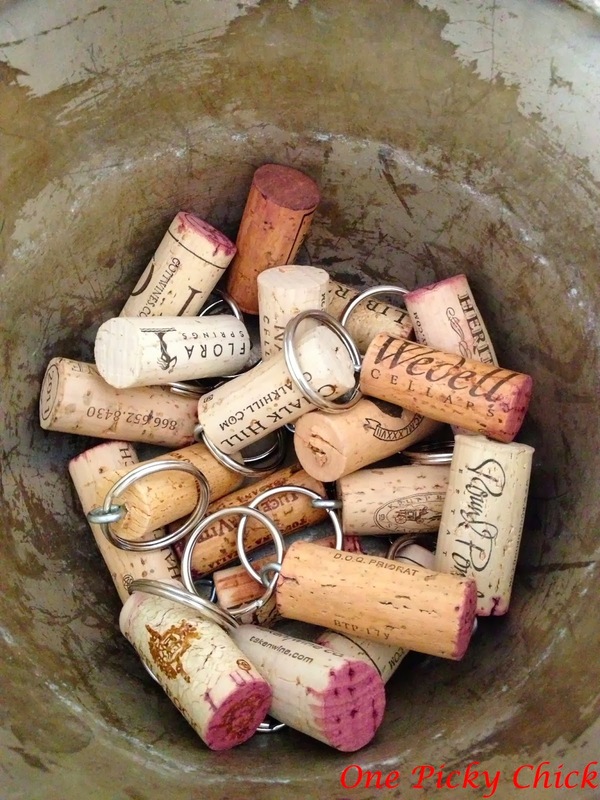 Bottom line: as long as you didn't have too much - that bottle of wine helped make a memorable night - so put a cork in it! Simple, easy, thoughtful. Cheers! Sometimes, a mom needs a break! That's when I call in for reinforcements. Can you see it? Do you know what it is? That would be a fast food microphone thingy. I was pregnant and craving a fast food fix. It was at this time my daughter asked what in the world we were doing? Perplexed... I proceeded to tell her we were going to do something we had never done before and she may actually really like it! I explained the process of "fast food"… i.e. : "you first tell people, via a microphone, what you want to eat from their menu, then you drive around, give them money and kinda like magic, it comes out the other side." She thought that was way cool. It was just like that, in an instant, the Taco Bell drive through experience was born. Now - let me back up. It has clearly been established that I am Picky on this blog. All 10 of you reading it now know that! Part of that pickiness extends to what I feed my children day in and day out. I really do care about that. It's a priority for me and it has been since they were born. I was one of those determined moms who breast fed their babies for as long as possible. With my daughter I did it (though down to once a day) until she was one. That was hard since I went back to work, the milk really slowed. I was seriously taking about 5 fenugreek pills a day. Plus pumping. What a joy that was, huh? Oh the times I did that in the newsroom bathroom. What a surprise greeted some random ladies when they walked in - Hello Nicole! My son I fed (not all day everyday but here and there) until he was about two. I know, I know… he was very attached. Literally. It didn't end there. From the start, their diets became mostly organic. I vary it up with fruit, vegetables, quinoa, pasta, eggs, salmon, hummus, chicken, I could go on… trust me they have some occasional goldfish and all - but for the most part they're super healthy. Oh, except for salami and those gummies from Costco my son insists on - it's like his life line! Anyways, every night I come up with simple, healthy, tasty things to serve them. Some of those recipes have been highlighted here and some are not blog worthy. They're just too easy. Possibly even insulting to some of you. Heck, most of you are probably better in the kitchen than me. Let's be honest. But sometimes… when you're in the middle of remodeling or moving or having a baby… you just gotta do it! You have to order fast food. It isn't organic, it's not good for you but it is food in the belly. I choose to believe that the best fast food for my particular purpose is Taco Bell bean burritos. They're compact, easy to handle, simple to eat, they come with their own "plate" and condiments. Oooooo and the Taco Bell Mild Sauce makes my mouth water! What more could you want? Besides, well, the obvious. There is only tortilla, cheese, beans, onions and sauce in this baby. No crazy meat or fried whatever… it's practically harmless. Not to mention, the only fast food we do. With the exception of an occasional In & Out visit when grandparents are in town or a french fry stop on a road trip. It is a real treat and, for me, a necessary one! Am I a bad parent? No. Everything in moderation… we do it maybe once, tops, twice a month. I am not creating food monsters. Really. But that is a slippery slope. Don't let it be a "gateway" food. Taco Bell burritos lead to McDonald's chicken nuggets which lead to Arby's whatever sandwiches or Burger King's - ah - burgers. I guess. I really don't know fast food. It could easily happen. It almost did happen to me. One day, about a year plus ago, we were in a major hurry. In between dance recitals for my daughter. We had a few precious minutes to shove some food in her mouth and go back to the theatre where she was performing so I offered to go to McDonald's and get her some fries and a cheeseburger. You know what she said? NO THANKS, I'll just take a Garden Burger at home. Lesson learned. Now, that's my kind of fast food. I'm sorry United States of America. Here in Arizona, we're eating outside! it is at this moment that, if anyone is reading this blog outside of the Southwest (or maybe Florida) here in the great ol' U-S of A, they want to throw things at me. Things that may hurt. I am very aware of that… and I am sorry, really I am. We are actually talking about you a lot. We feel bad, almost guilty, for our good weather this winter. For the record, this has been the best winter I can remember in any recent history. We had (our version of) snow during March last year. Two years before that they had to delay one day of the Phoenix Open because it was so cold and rainy/snowy. 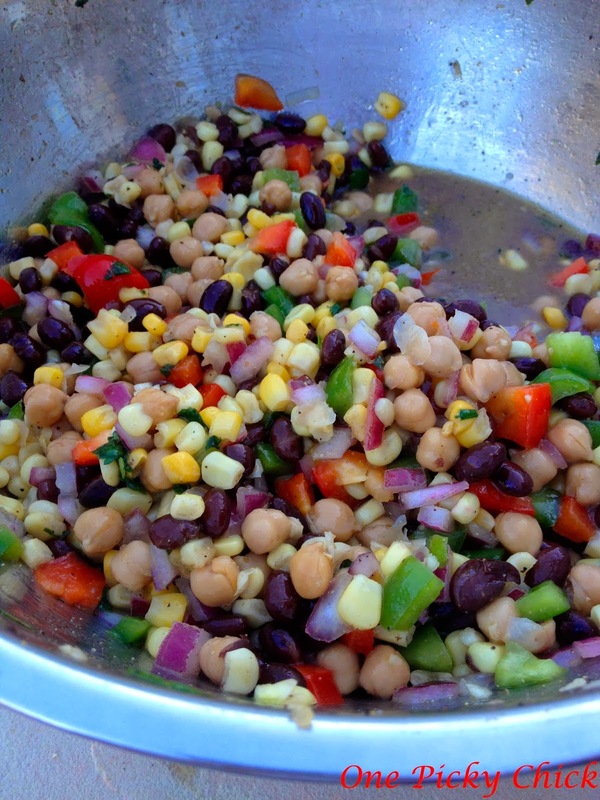 grilling and eating bean salad. You know, the kind of meals you serve during spring and summer. We are doing it now. What the….? Anyways, it just got me thinking, maybe just making a "spring meal" would help bring the sunshine in. Okay, it's a stretch but… a really tasty one. BP (husband) loves this recipe. We make it when I need a - no hassle - major yum - side. I can make it the morning of, or day before, and the longer it sits, the better it tastes! Like fine wine… kinda. 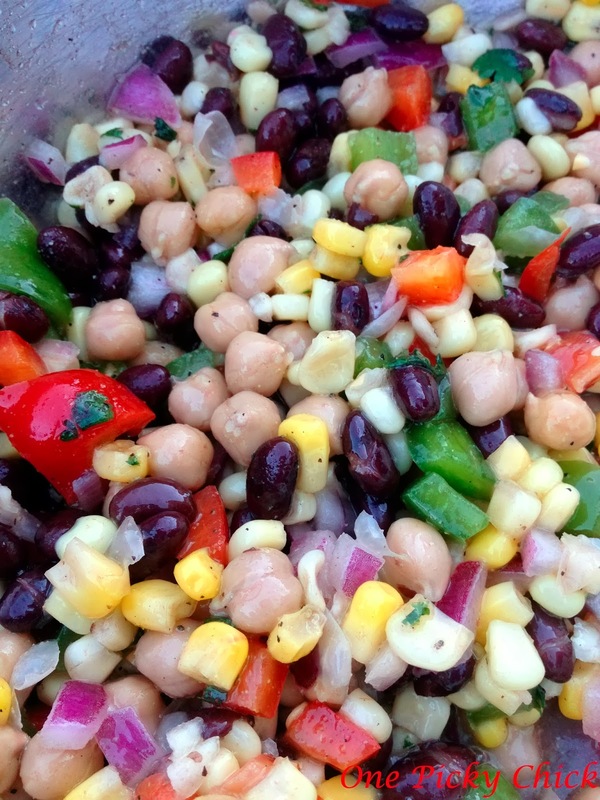 It goes great for a lunch or dinner, with meat or sandwiches…. kids or adults... and look how pretty it is. SO colorful! Did I mention healthy, HELLO, really, you just can't lose with this guy! Dump everything in to a large bowl. Mix, refrigerate. See, my kind of side! It's like impossible to screw this up! So, no matter where you live: New York - Minnesota - North Dakota - go make this, bring in your own sunshine! Just please don't send me hate mail. This really does come from a place of love… and sun. Today we begin some more remodeling. So our painter is now healthy and in our house painting. God Bless her! The poor thing was sick all last week with the stomach flu. But she's great, we've used her for multiple houses over the years. Anyways, this is officially kicking off the remodeling process again. I love that! I am now thinking about the next step, after paint is done. The floors. Trust me, I didn't just start thinking about this… it has been a work in progress for a while. Half of it, is easy. We're putting the same paint and dark wood floors we have in the rest of the house, in our master, closets and office. For the most part, it now has this brown carpet in it. I think it was the late 90's perhaps when this was popular. But the carpet seemed very new when we moved in 2 years ago so I'm pretty sure they put it in a lot later than that… hmmmmmm. No judgement. Just different strokes. I - ahem - am picky! In any case, this is the sticking point. Do we continue with the dark wood in the bath or do I put a type of tile in it. Remember, my style is defined as "Desert Cottage" and I really don't like most tiles out there right now. For some reason they look too Tuscan or too dated to me. But I'm a little worried about wood floors near the bath, shower and doors to our outside pool/spa. Not to mention - we will be completely re-doing our shower and bath with all new tile sooner than later. That could rip up the, rather expensive tile - strike that - incredibly expensive tile, we'd be installing. Actually, I think I just made my decision. Yep, at this point, I'm leaning towards the wood. 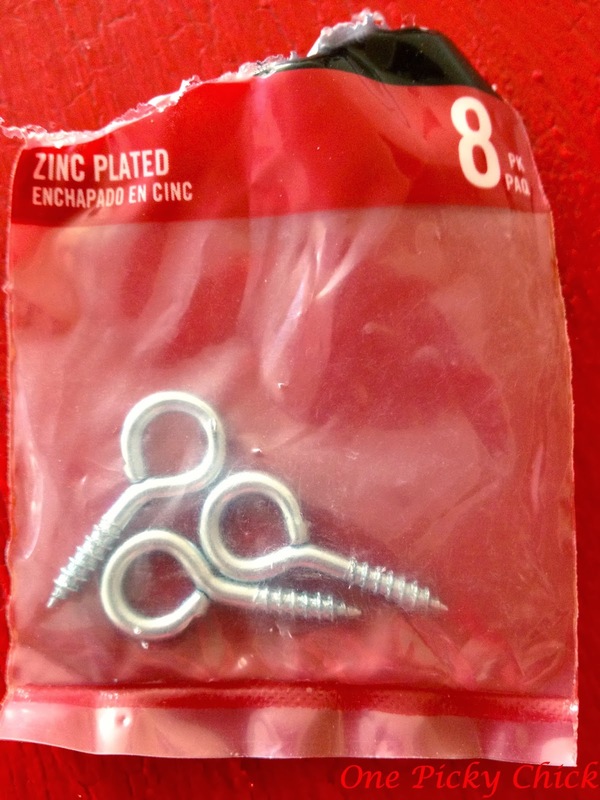 We can easily buy a little extra in case something goes awry with that shower remodel. But that's today. It could all change tomorrow. So I think they can handle this brick type tile below. I will be combining 4 colors. It makes me nervous simply because there are no real pictures of anyone doing that, that I know of… the company typically markets/sells it all together, in one color. I like the idea of combining the colors so it looks more like real brick. Now I just need to decide the pattern I want them to lay down. This, below, or the more chevron type pattern. To be determined. Alright, that is all for today. I am super excited to get this party started. It's a lot of planning, number crunching, instinct and debate but I love it all! As long as I… love it all when it's finished. Gulp. Die & go to Chocolate Heaven this Valentines! I hate spending (too much) time in the kitchen. 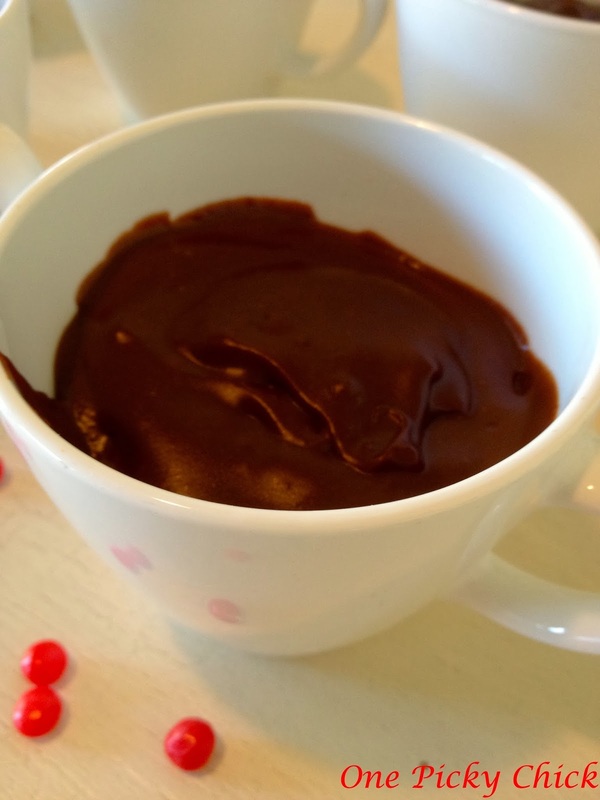 This rich chocolate pudding takes 5 minutes to make! My house is an absolute nightmare right now. It looks like my 2 bedroom closets threw up all over. I like to keep a decently tidy house. This... is the antithesis of that. Why all the chaos? Our painter was supposed to begin painting my bedroom, bathroom our "his" and "her" closets plus the office this week. She got the flu. Therefore, as we speak we are living in the middle of an episode of that Hoarder show on, what is it, A&E??? Really. It's that bad. But I'm trying to put all of that aside - for one day - in order to celebrate Valentines. Yes, I'm just going to pretend I haven't been wearing the same 2 outfits all week long. On the big day of love we usually don't go out. Sometimes we'll go out the weekend before or after but never on the day of… for much the same reason we don't go out on New Year's Eve. I'd rather stay in on the exact holiday. This heart day, I have an idea for BP (my husband) - we'll see if it works… if it does I may blog about it next year. 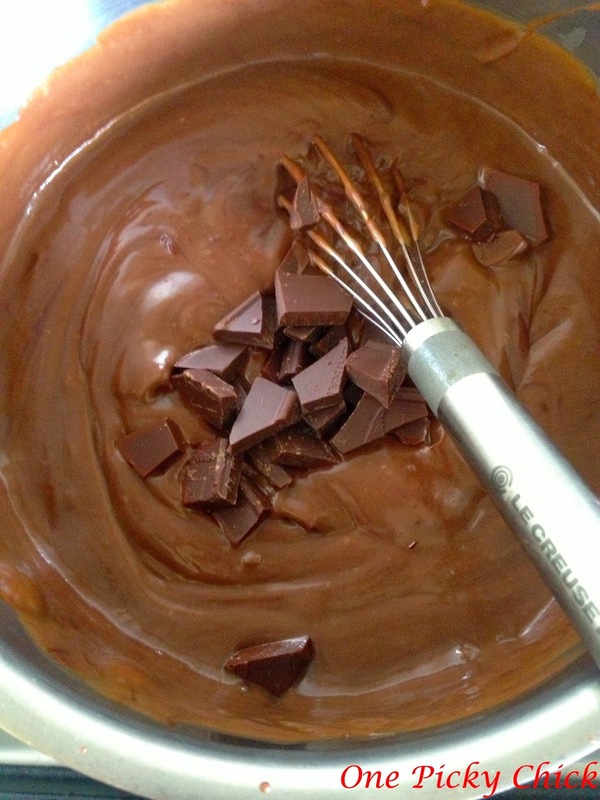 Back to the subject at hand: one idea that I KNOW will work - Double chocolate pudding! 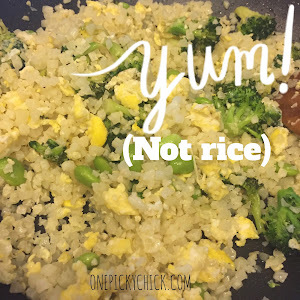 This stuff is major yum and it may take you all of 5 minutes to whip up! 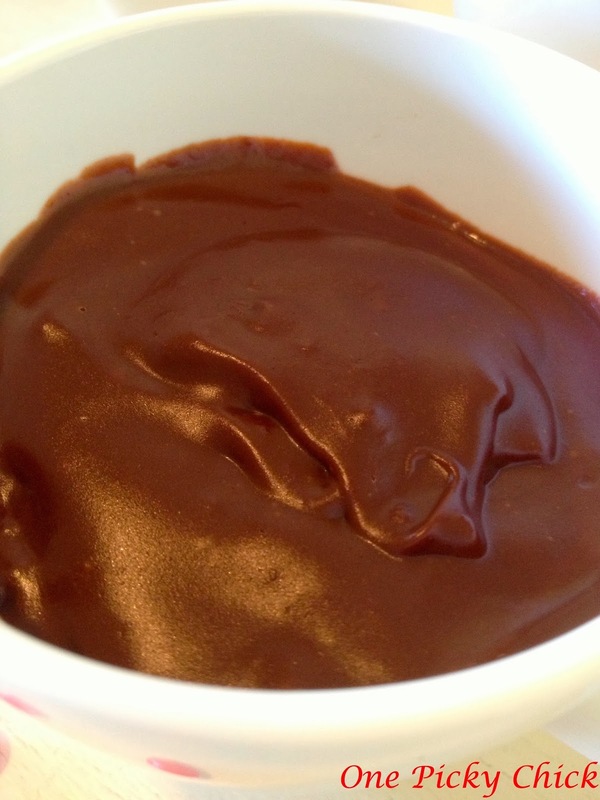 It's so easy, so yummy and so decadent… you'll feel as if you've died and gone to pudding heaven…. or something. What makes this treat even better is you may already have everything in your pantry to cover it. When I first made it, surprisingly, I did! It makes about 4 cups of pudding, if you want more, double it. 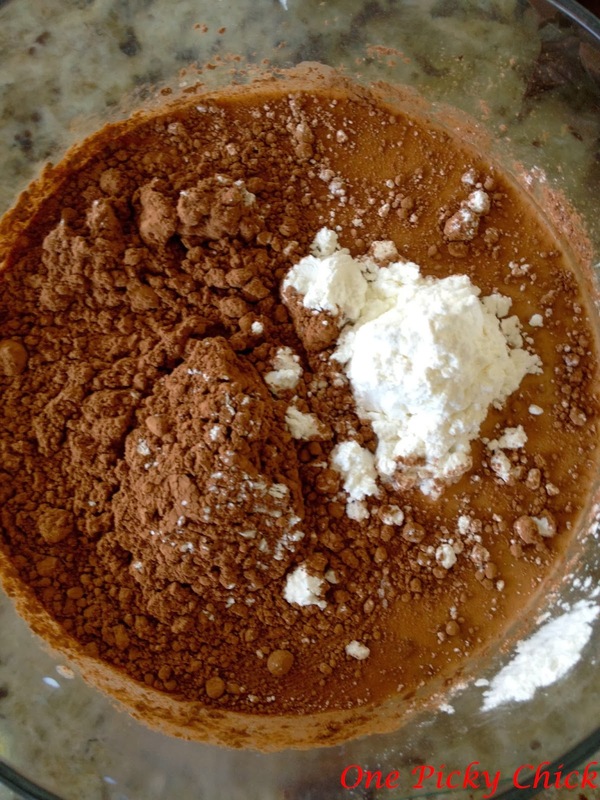 Combine 1/2 cup of milk with sugars, cocoa, salt and cornstarch in a jar or bowl that has a lid so it can close tightly. When ingredients are combined, shake vigorously. It needs to be blended. Pour the rest of the milk into a medium sized sauce pan and heat over medium flame. 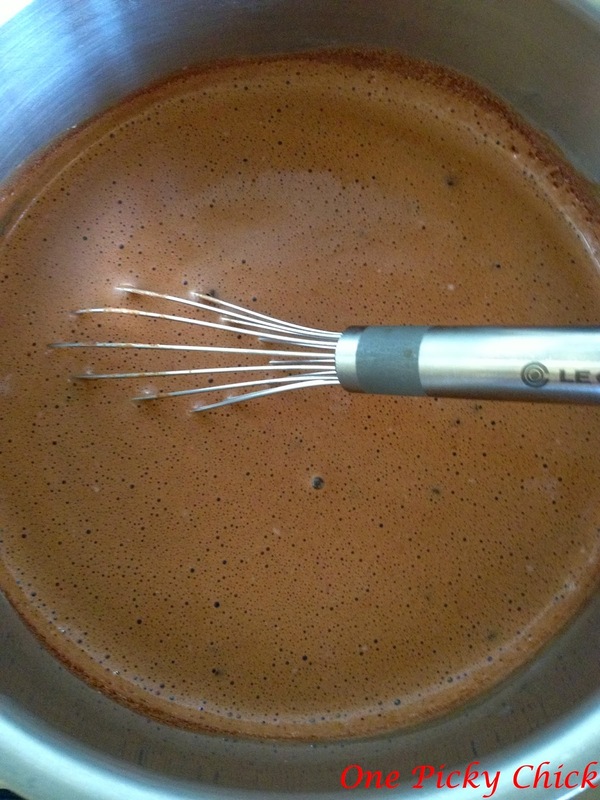 When bubbles start to form on sides add cocoa mixture in and stir with whisk to combine. Cook until it thickens. About 3 minutes. Remove from heat and add chocolate and vanilla. Stir to combine. 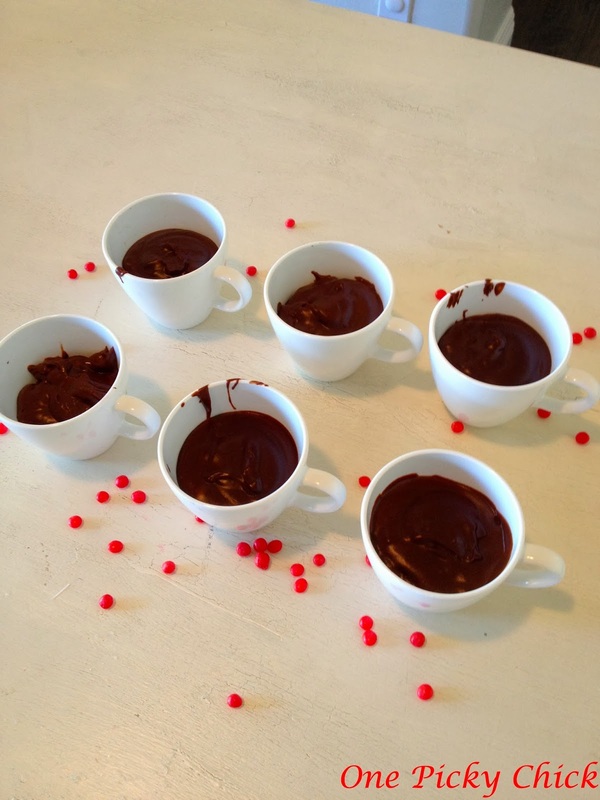 Once all the chocolate has melted, spoon into cups or small bowls. Serve hot or cold. Top with whipping creme if you so choose. They are rich, creamy, elegant mouthfuls of chocolate love. Perfect for Valentine's Day. Take a closer look. What I (also) love about this desert is… you can make it the day before, or the morning of your "dinner" or "event" and it's so easy to serve. Some deserts require you to make and serve right away. Great - if I have a personal chef in my kitchen doing that for me! Not so great if I'm the personal chef. What am I supposed to do… excuse myself for an hour after dinner while I prepare the desert. Yea, BP would fall asleep in that interim. It could never fly here. Anyways, happy heart day, from the bottom of mine. You should totally make this today, even last minute, this desert works! It's time for a boy's birthday party. My son turned 3 recently. 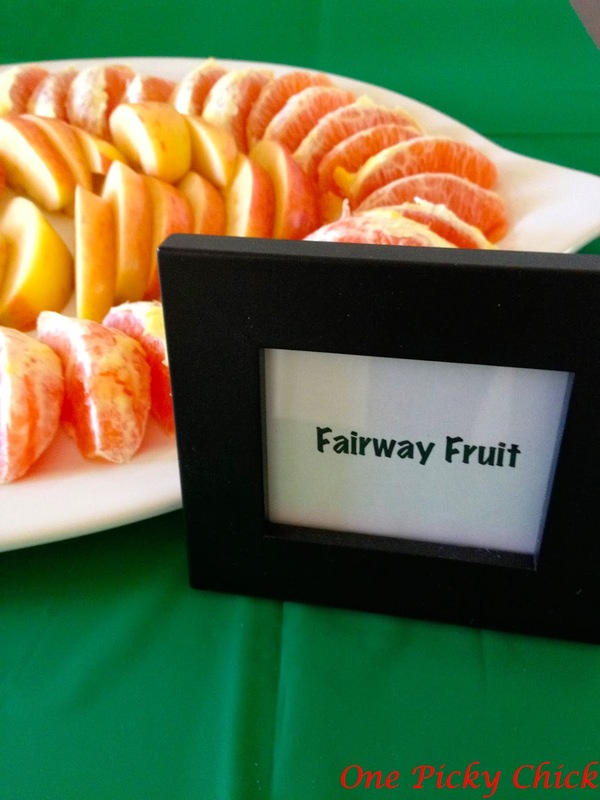 I love planning parties and the two men in my family love golf so we decided to combine the 2 and do a golf party. I like themes for parties but I'm not a huge cartoon theme party person. 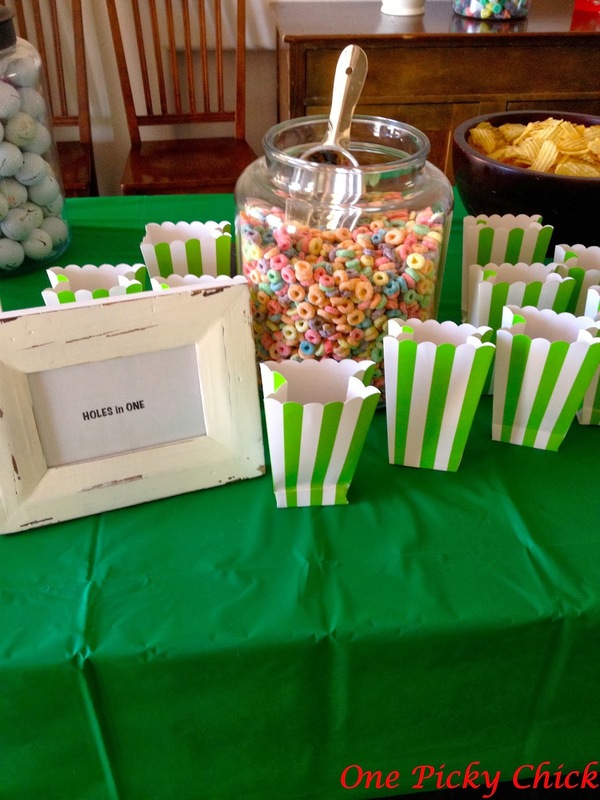 Meaning, I don't usually do theme parties like "Toy Story" or "Sponge Bob…" I like to make up my own. As I've said before, every great party, starts out with a cool invite. I really liked mine this year. I bought green cards and green gingham tape. I love that stuff… it's everywhere now and so easy to work with! I applied the tape and glued a Tee to the front. Again, I laughed at it. Hope someone else did too! Then I used that gingham tape again. So cute! After the invite, the next thing to figure out is the cake. This, of course, is a big deal to the party person! Every year, I buy my cakes and then morph them into what I want. Like this. The idea was a golf ball lying on some grass. 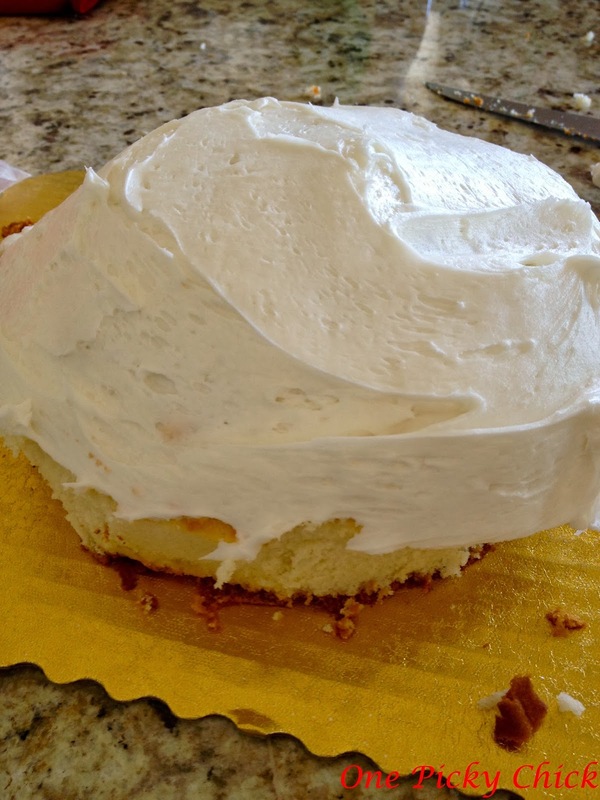 I went to Albertson's… my go to cake (grocery) store. Their cakes are really good. Like, surprisingly so… anyways, I ordered a half (chocolate) sheet which they frosted green. It's the dirt and grass of the "golf course." Then I bought another quarter sheet in a white cake. I cut that into a circle. A lid guided me. 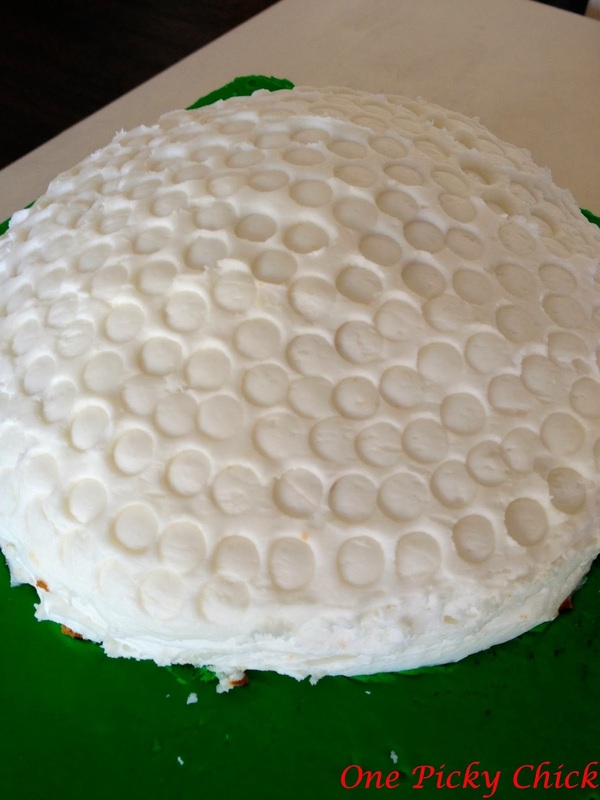 Then some of the side leftovers I stacked on top of the circle to make it appear more round, like a ball, and frosted it. 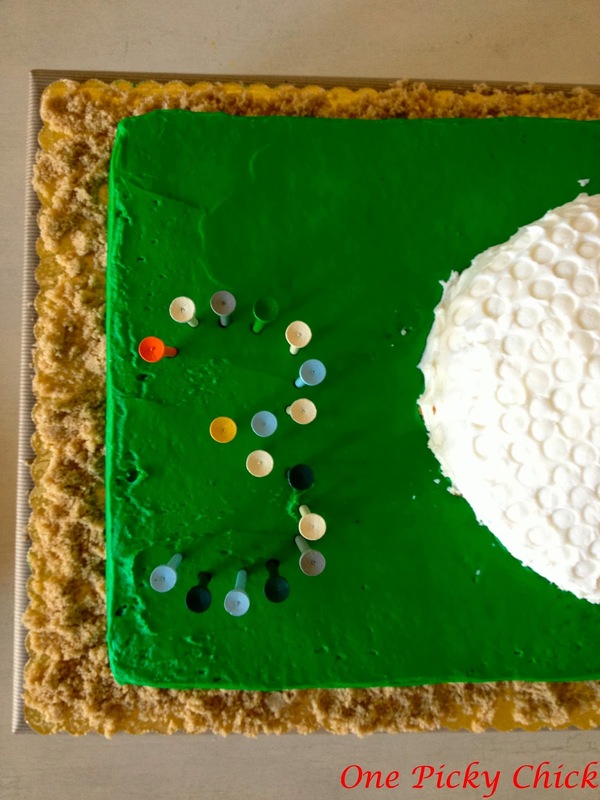 Once I was done I put it in the fridge a few hours to harden, took it out, grabbed a Tee and pressed the top of it into the cake so it got those round, circle divots, like a golf ball! 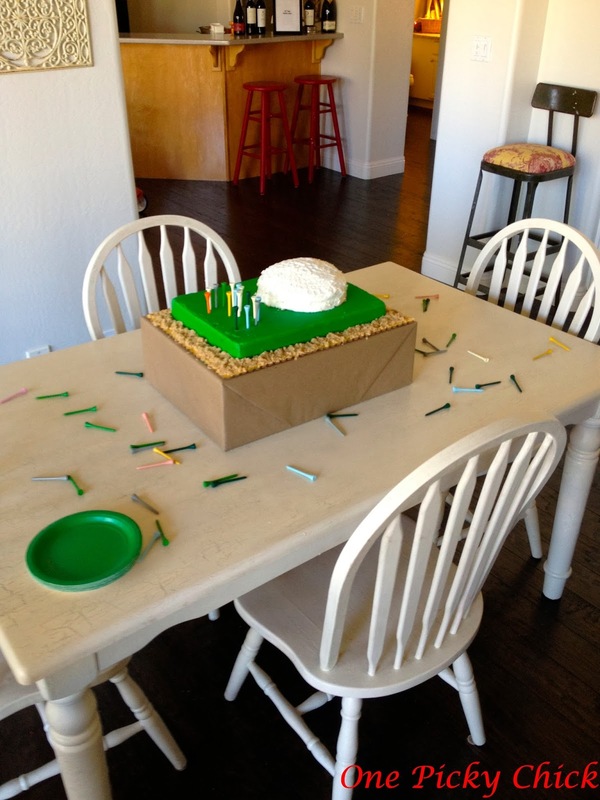 Then I placed it on top of the grass cake. The top worked perfectly. The sides were too sticky (perhaps they didn't get cold enough, I'm not sure) so there were no little circle shapes in that area. I am not the perfect froster. I don't do the crumb layer and make everything totally perfect. For me, that's okay. I like it to look like I had some part in making it! Not like it came from the bakery. We decided to add the Tees in the form of a "3"… and also that's brown sugar on the very bottom. 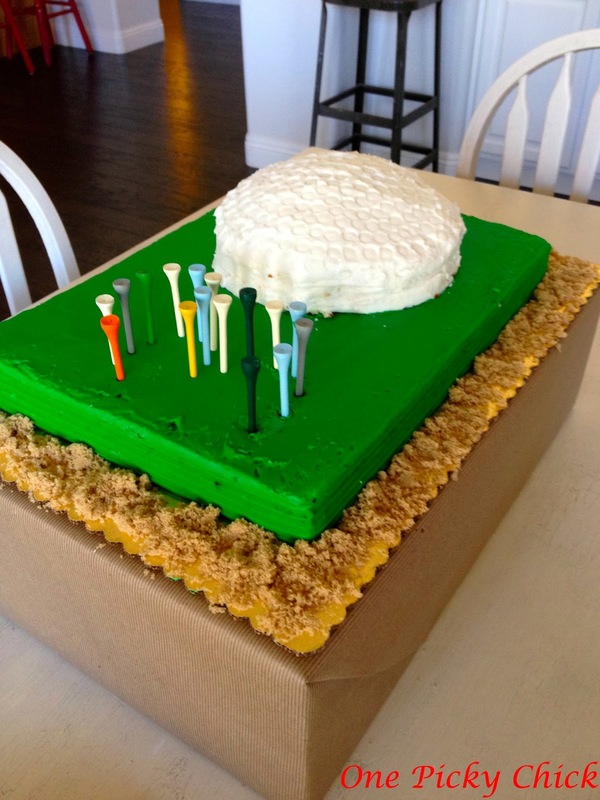 It hides that awful cake tray and it looks like sand on the "course"! All in all, it looked really cute. I was happy with it. Okay, now the actual party. First of all, my family dressed like golfers. Not hard to do since they all are… except me. But I think I looked the part too. No pictures. Sorry. I tend to forget about those. Once kids arrived I put them in sunglasses to get them in the mood! 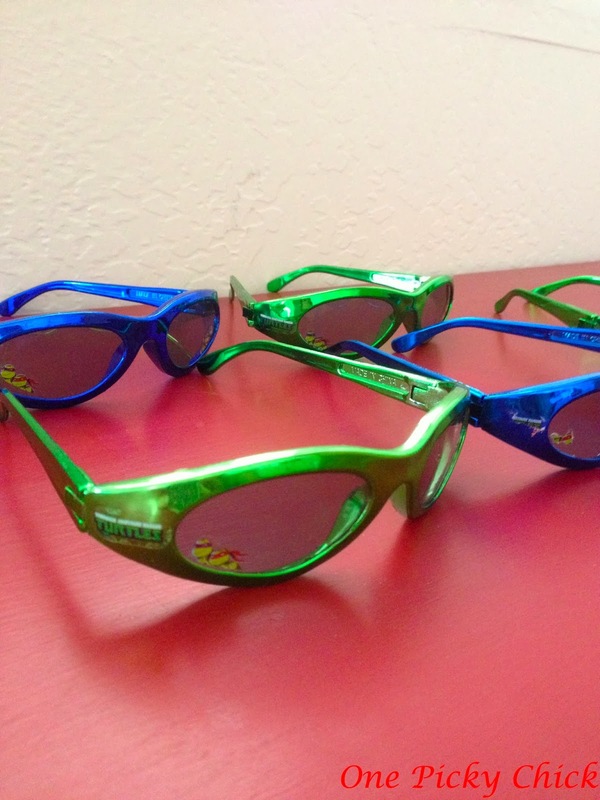 Yes, they were "Teenage Mutant Turtles" brand but you could barely see that! When everyone was pretty much here we started to play our games. 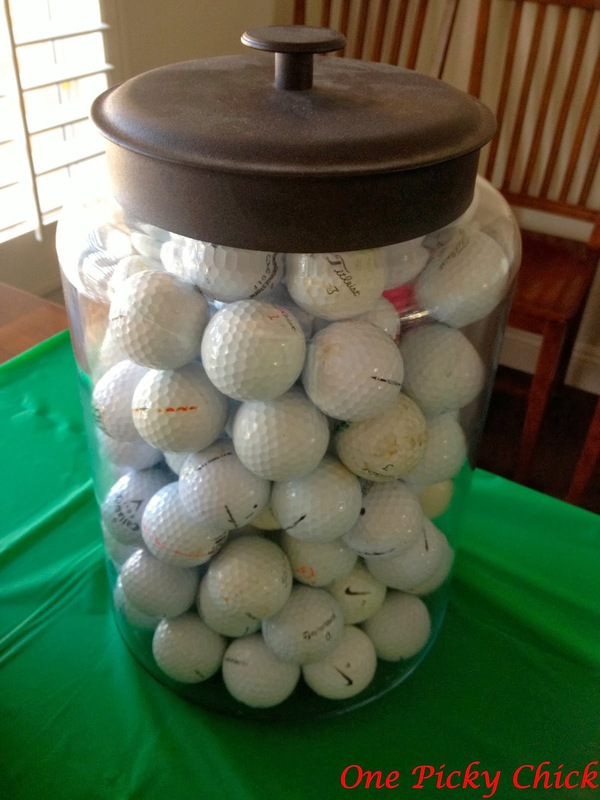 The first one - guess how many golf balls are in the jar (some parents helped with that). Good game and, you know me, I always love big jars filled with stuff! Second - a putting game of course. 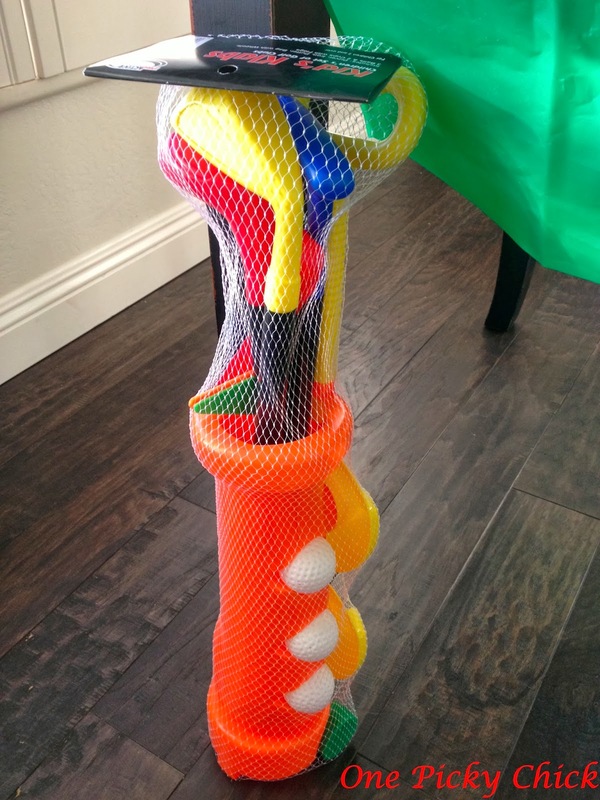 Third - a "hole in one.." you could do this with anything but I used our pool net hole. The kid who came closest to throwing the ball in the hole, won! We gave suckers as prizes but the main prize was given to the child who came closest to getting the right number of golf balls in the jar. A girl nabbed that prize! Not bad! 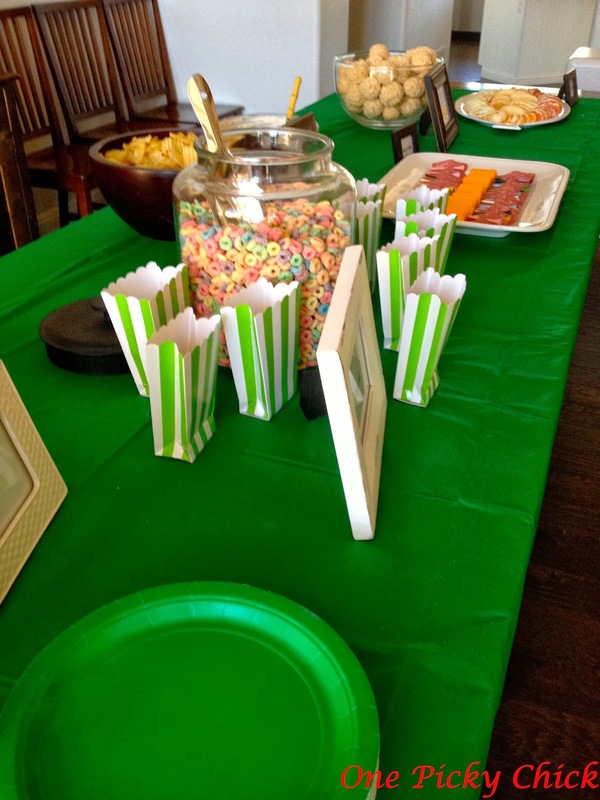 The snack table was fun! 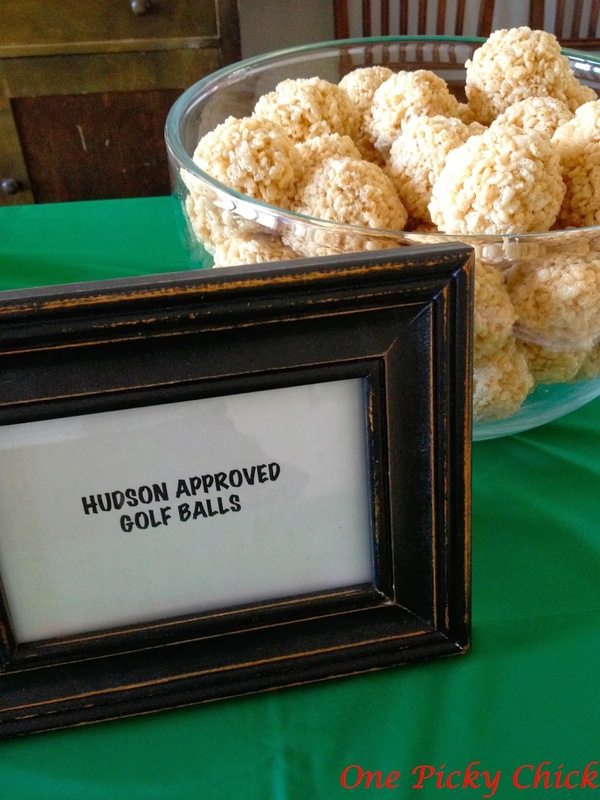 "Hudson Approved Golf Balls" were simply rice crispy treats rolled into balls. 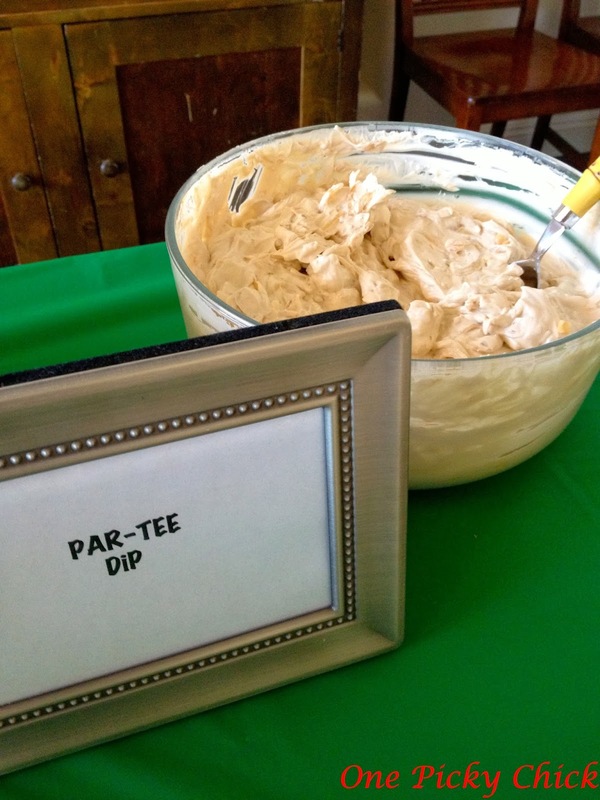 We had a Par-Tee dip. 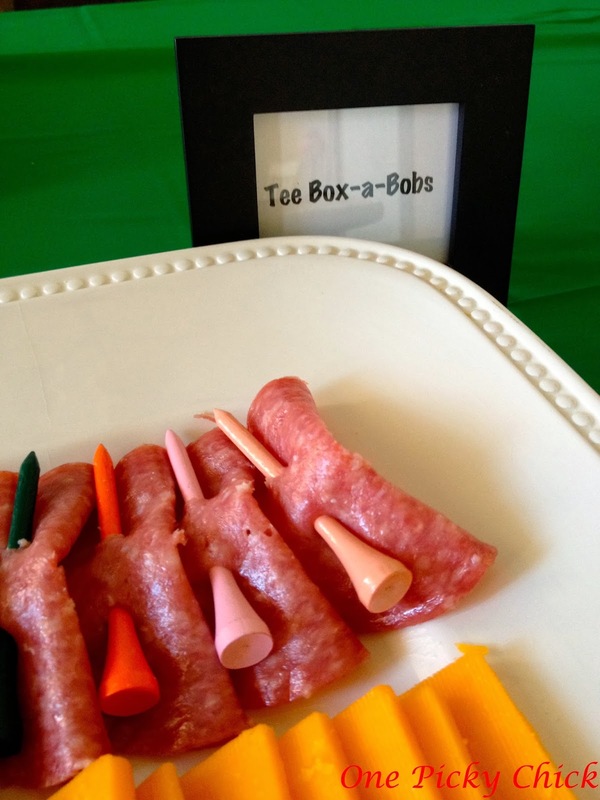 "Holes in One…" this, by far, was the most popular with the kids! 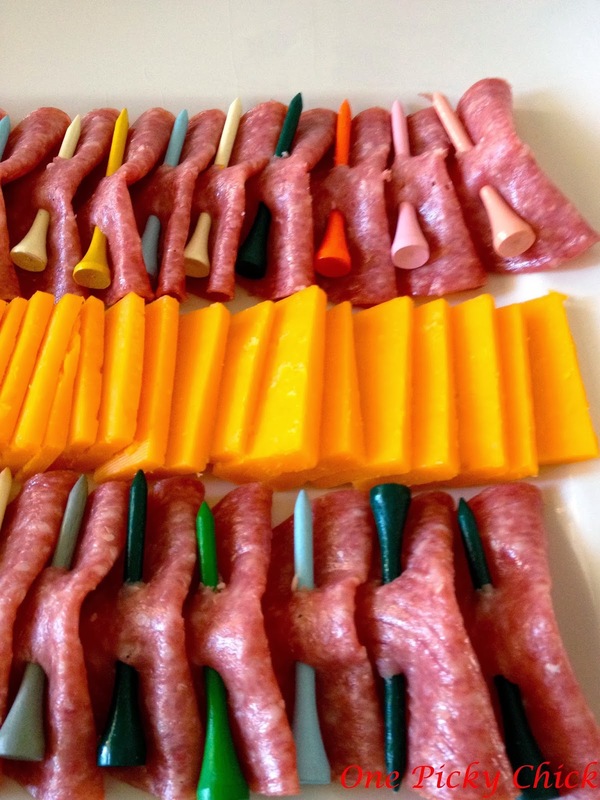 I also did "Hudson Approved Golf Sticks" which were some veggie sticks. 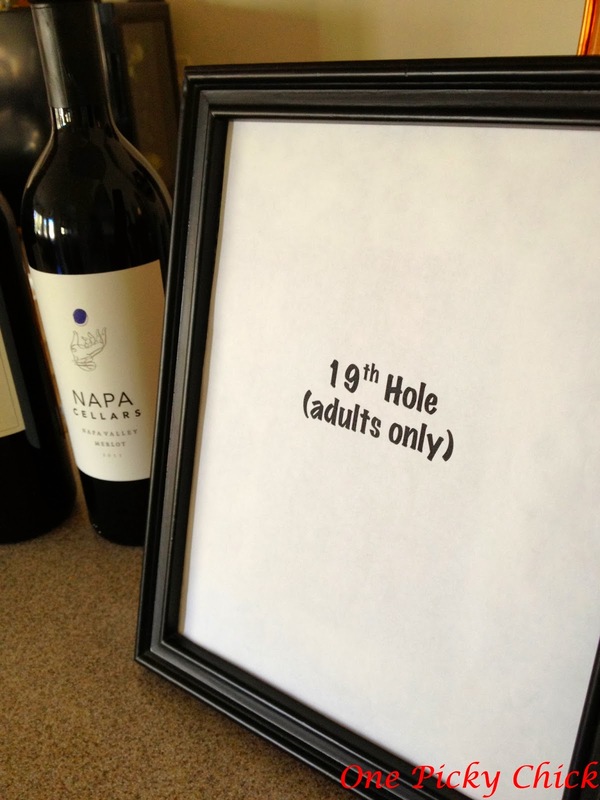 Finally, there was a 19th hole for adults only. 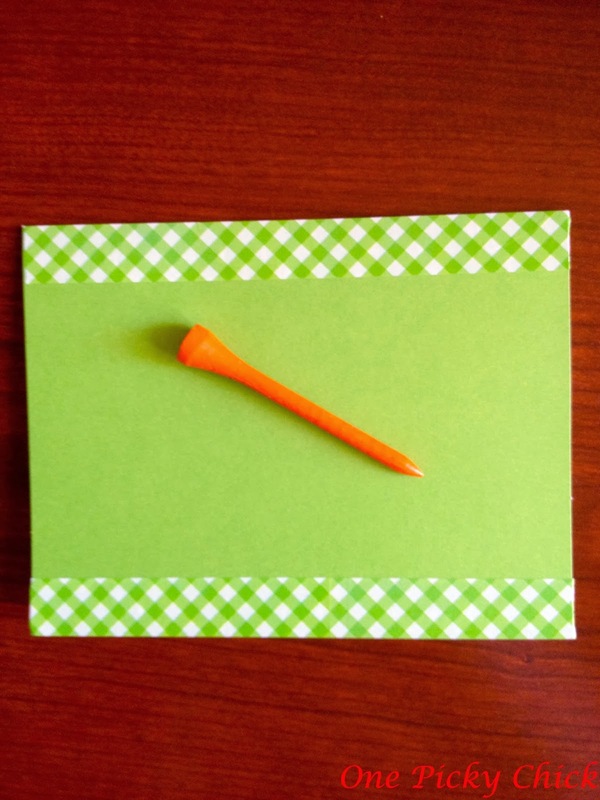 I''m not a golfer so I didn't get it… but there is no 19th hole on a golf course - it's what they call the bar. Once I understood I thought it was awesome! For real food, we just grilled! 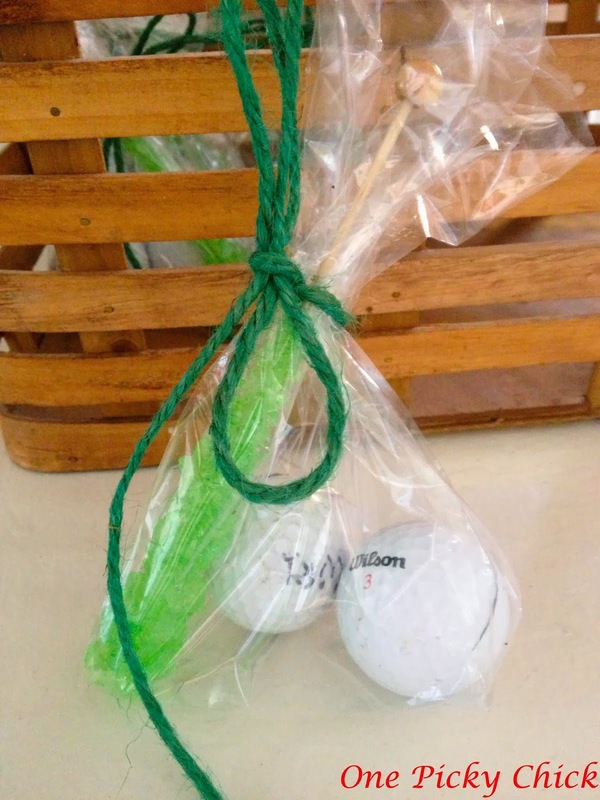 It was loads of fun and when it was done each child left with, what else… some golf balls! Golf party in the books. Check. I mean, Bogie. Or Birdie. 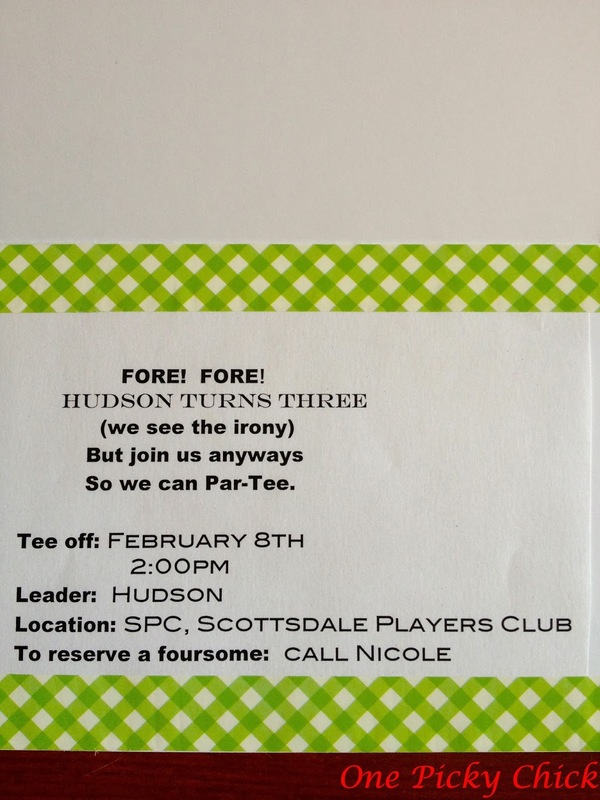 Or fore. Whatever, you know what I mean! Egg - It's What's for Dinner! Really? What DO S-A-H-Ms do all day?